jazzoLOG: May I Have This Dance? There was a simple notice in the Events Calendar in Thursday's The Athens News that the Ohio University Jazz Ensemble would perform for dancing at the Athens Community Center on Saturday night. The band is made up of around 15 students playing the traditional instrumentation of this music (3 trumpets, 3 trombones, 5 saxes, 4 rhythm) and I was unaware they had developed a dance repertoire. In most parts of this nation, an opportunity to invite your partner to an actual dance in a ballroom is so rare that I jumped at the chance. I marveled at the wisdom of a teacher/leader to attempt to teach this tradition to a new generation of young people. When we got there, a table was set up at the door and they wanted $25 to get in---but "String Of Pearls" was playing inside, so I plunked down the cash and we walked through the door. In the United States a band of this size initially was constructed for patriotic celebrations in the town square. The armed services had them too, and if you got conscripted during war and could play or learn fast a wind instrument you could do your time in a band. During the Civil War, black units had bands too, and many historians trace the birth of jazz to what these soldiers did with their horns during spare hours. Drums were banned on plantations, but the rhythms of Africa still were fresh in memory. If you saw Martin Scorsese's film about blues, an image probably is forever etched in your memory of a fife player accompanied by 2 guys on snare and bass drums. What an unlikely combination, but what incredible music! In that trio of players you could see blues, jazz, and American dance music born at once into this world. 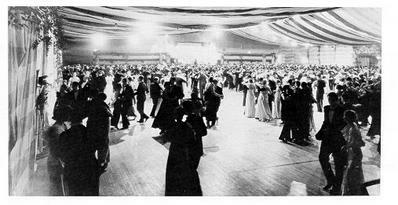 Through the 1920s the nurturing of bands for social occasions that included couples dancing together became strong. White and black bands played very different music, celebrating folk customs of Europe and Africa respectively. But by the early 1930s, members of these bands were seeking each other out after-hours in non-segregated settings...and learning the other's riffs. With the mid-'30s and culminating in the 1938 Carnegie Hall concert by an augmented Benny Goodman band, to include many of the greatest black players of the time, this country had Swing which was a music that combined all the elements of the Melting Pot---and by God, you could dance to it! During the 1940s and into the '50s, there were so many dance and jazz bands, containing around 15 men and women, that no one even could count them all. Any city of 20,000 inhabitants had a local one of its own, to say nothing of the hundreds of bands that were popular enough to travel. They went in cars and sometimes buses, often driving all night to get to the next ballroom. Duke Ellington's band had its own train. Sometimes they formed baseball teams among the musicians, challenging local teams in the towns where they were playing a dance that night. Life on the road apparently was the stuff of legend, and anyone who's lived long enough to be involved in this music has some stories. I became aware of these bands in the late 1940s. My father was program director of a local radio station. In 1948, the long playing record came on the market. The recordings initially made available music originally sold on single 78 rpm sides. A 12" LP could hold six 78s, and so many radio stations started to throw out the older records to make storage space for the new. I was around 3 different radio stations over the decade in which that happened. At first, I listened to anything these stations threw away, but soon I was listening to the bands---and I never stopped. I parted company with the majority of my peers when rock became popular, pledging allegiance instead to this music I found so wonderful and important. In the summer between grade school and junior high, I invited a girl to go to a dance with me at Waldameer Ballroom, an hour's drive from my hometown. The Dorsey Brothers were playing over there in a hall high above the shores of Lake Erie. My father drove us, and then disappeared into the darkness of the great ballroom as the girl and I enjoyed surely one of the most magical evenings of our lives. The space was immense, all wood, and the sound so glorious I hear it in my mind even now. The great and inevitable glittering ball reflected lights on a packed floor of dancers who really knew their stuff. The trick in this kind of dancing was to know the actual arrangement so well that you could anticipate what was going to happen with your movements. When you had enough people who were doing this, the musicians would respond with such inspiration that the love between players and patrons was tangible. By the 1960s and '70s you could count the number of bands remaining on your fingers. Television and stereo were keeping people home, and musicians had to find work in those studios instead of on the road. There were obvious advantages for family men among those players, but jazz fans deplored these developments---and I hate to say we often blamed those guys for the death of the music. We overlooked that increasingly there just was nowhere else to play---no ballrooms, no clubs, no bars that could afford anything more than a couple of guitars. Stan Kenton had the idea that universities could house bands, and through teaching the music maybe preserve it. At first it worked pretty well. Since jazz and dance music never had been taught in school, the first people hired were musicians who knew how to do it. Improvising is not easily taught, nor is a knack for swinging. If your dad or mom knew it, probably you had a better chance of picking it up than somebody taking music lessons. The first college stage bands were pretty tense affairs, and very difficult to listen to. But after a very few years, and some excellent arrangements written especially for them, they began to get good. Through the 1980s and 1990s, many of them became very fine indeed---and I used to attend any concerts I heard about. At the same time larger cities across the nation developed excellent adult stage bands that were held together through subscription and concert appearances. But then inevitably probably, the thread of continuity began to get lost. The guys who led those bands---guys who had been on the road themselves---began to retire and die off. The kids who had been taught were hired to take over...but never had been in a band that actually toured and developed a resulting ensemble sound, or even played out at a dance. They don't have the feel for it...and can't inspire when they stomp off the downbeat. The kids never have danced to the music they're trying to play. The students Saturday night were struggling and working way too hard. They hadn't rehearsed or not done it before or not done it enough. There were moments of loss that were excruciating. The dancers made the best of it, but most of them seemed to be at least 70 years old, which means the audience and demand is getting even more sparse. One bright note---and maybe a glimmer of hope: in the crowd were 4 OU students (and that's all the students who were there) who must have taken some kind of dance lessons. They were rockin' out with all the right moves, and having the time of their lives. I don't know where they came from or what it means, but maybe the music is carrying on after all. Perhaps somewhere in their consciousness is a ghostly ballroom down a country lane, with the strains of Glenn Miller playing a romantic ballad, and the soft sound of shoe leather gliding across a wooden floor. No one told me that the dance bands were out. Wayne's Birthday was yesterday and we had a party to celebrate his turning 65. Everyone was here and he hired a dance band. And we did it all from the jitterbug to the Samba to the waltz and on't tell...but a couple of us even did the belly dance. We had the pino, horns, drums, Bass and a bongo drum and another new fangeld drum that had a really cool sound and we had a ball. And we had beer too. And we had a ball......room....of fun. PS... with the move and all I got new IPs and rats I don't remember my password any more and don't know how to get in here. I don't want a whole new identity. Just the same ole me. 5 Apr 2004 @ 09:03 by jazzolog : Is An Accordian A Band? I suppose we do have one-(wo)man bands---and you can dance to a quartet or quintet...but I'm writing about big bands. Anyway, Happy Birthday Wayne! And my 65th is on the way. Good to know such a wonderful guy is up ahead clearing the path. PS Probably Ming could provide your password if you were to ask. I couldn't help but remember. I'm not really old enough, but there was a retro dance phase in Madison when I was a teenager. I used to go out Ballroom dancing with my brother-in law. my sister was finishing college, or shipping out (she was in the merchant Marine, retired now). But Tim lived with us and we went out dancing, being a good match size wise. We usuially went to the "New Hyperion Oriental Foxtrot Orchestra" which was usually playing around town somewhere. Of course there was no way we could have scraped up a 25$ cover. 5$ maybe. We always claimed that If you were dancing well at the end of a dance (especially a rousing waltz) you should end up either dizzy or in love or both. When the big Band wasn't available, we would go do polkas schottiches and waltzes at the local country bars (Wisconsin still has a family night at the local road house) Everybody dances. Grannys and kids....grampa takes little suzy outon the floor to teach her to polka as soon as she can walk. Or we'd go English Country Dancing, or to the contra, square or folk dance nights. We really didn't care. My husband doesn't dance, but we juggle which is also a rhythmic partnership kinda activity. Multi focus and double process. There's no reason to block if you don't put it into play. or I won't remove it from the game. have you ever heard of a bird of paradise? you don't have any thing I can't beat. A thoughtful piece. Jazz has always been a mentoring process (think of teenaged Jackie McLean and Sonny Rollins going to Monk or Bud Powell's apartments for music lessons! ), and I do not think that academic institutions can recreate this as well. And you are right: once the academic programs are taken over by folks who only have experience via the academic program, the dance band will wither away. The only future I see for the big band is concert music, such as what Bob Brookmeyer does with his European contingent, the New Art Orchestra; Maria Schneider; The Vanguard Orchestra; Toshiko and Lew Tabakin; Wynton Marsalis and the Lincoln Center Orchestra (and it was said to see Carnegie Hall disband its contigent led by John Faddis); Bill Holman. Don is a favorite roommate of mine during college years, and obviously knows his jazz! Ah well, for us stay-at-home types there's always BBC recordings of Big Bands, Swing Bands and Silly Songs, with 'kitchen dancing' late into the night. A seriously under-rated passtime, kitchen dancing. 7 Apr 2004 @ 18:10 by scotty : Kitchen Dancing !!!! I PROMICE you Caroline is not kidding !! When I went home to Edinburgh last year Caroline was my delightful (very attentive) hostess - and I can swear to you that she DOES dance in the kitchen - very lively and spry she is too ! I always have been something of a front parlor dancer, but also like getting up from the dinner table for a twirl or 2. I have a feeling dining room dancing may be a different tradition from kitchen dancing though, at least as you 2 ladies do it. I have heard it said Scotland is a wonderful place to convalesce. 'Twould be grand to awaken in the highlands. ....it is a wonderful place and would love to have you convalesce here. The invitation is genuine and open. However, if you want to awaken in the Highlands best not to fall asleep in Edinburgh, unless it's on a bus. We have a wonderful range of volcanic hills around the city, which is also situated on an estuary, but the Highlands it ain't. Easy access by coach tour, though. Perhaps a tour of the distillaries? How much more tempting can I make this? By the way Scotty: not sure about that 'spry'....makes me sound ancient if not too bad for my age. Lithe; fair enough, lissom; anytime, Isadora Duncan reincarnated even nearer the mark. Pay attention now. We need to prepare for Scotty's arrival at any moment, and in the past she has been swift and hard upon me for so much as listening to the invitations of the other Ladies of NCN. Under the circumstances perhaps a compromise can be reached. Regarding the distilleries, since my water works may be profoundly involved in the proposed changes 3 weeks down the line, I may need to take some time before that particular tour. I'm sure I'll do some experimenting as soon as I dare, but we should wait upon the results before settling on a final itinerary. No: Scotty knows you're safe with me, although I may end up ganging up with the Missus. Stereo-nagging is a wonderful thing, god-wot. Meanwhile, post-operative symptoms can be a bit wierd (when I had half a lung out some years ago no-one so much as mentioned that the upper left quadrant of my body would be numb or pins-and-needlsey for about a year) but they tend to move on. All in all, although I wouldn't recommend rushing out and asking for it, it's an interesting sort of a learning curve. There is indeed something "right" about that combination of instruments--just as there is for the Mozartean orchestra, the SATB chorus, the string quartet, the two horns and rhythm assemblage of countless jazz combos, etc. It is a timeless group, and I suspect a hundred years from now there will be groups of, perhaps, students guided by earnest academics, who will be "reviving" that music for the nth time. Certainly it is emblematic of such an important period of American history--perhaps to be seen in retrospect as the greatest period--where the country threw off the depression and the rise of fascism in that order. "String of Pearls" indeed. . .
No wonder Allyn could write such a lovely comment. Professor Reilly is Interim Director of the Ohio University School of Music.